One of the best muddin' tires I've found so far is Pitbull Rocker's and Rocker Ubers. Here's some pics of them. World of ATVs answer: Thanks for the tip and here's a link for more info. 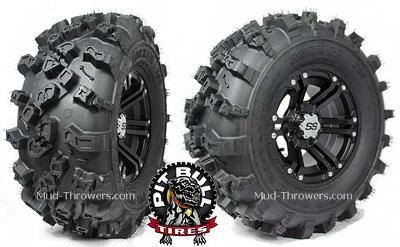 The Pitbull Rocker II XOR (Extreme Offroad Radial)looks like a serious contender in the ATV tire wars. It has several interesting features that need a closer look. The unique tread block pattern uses varied block sizes placed in a non-directional pattern. The idea here is to provide better clean out of mud and debris, and more edges for bite in forward and reverse, as well as when cornering. 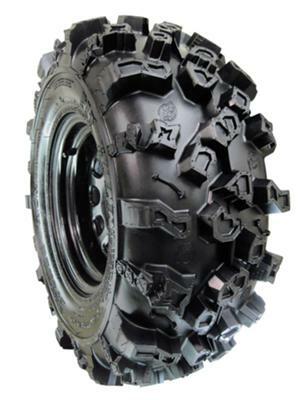 An 8-ply rating and built in rim guards provides extra toughness that many of the top selling ATV tires don't have. Given all the off road racing experience the Pit Bull guys have, we would say there's a good chance they know what they're doing. We found out these tires are getting a lot of positive buzz as a good choice for not only ATV mud tires, but as an all around trail tire. Reports are that they work well in dirt, sand, snow, and rocks too. We are hearing that a lot of folks like to run the Pit Bull Rockers on UTVs and the bigger utility 4x4 ATVs. We don't know if the Rockers are the ultimate tire for ATV mudding, but we think they're worth a look as one of the better all purpose tires available. Comments for ATV Mudding Secrets - Pitbull Rocker ATV Tires. I hadn't heard of these tires, so thanks for telling us about them. I'll check 'em out.